It took me a few hours to get my bearings on my first visit to Stockholm. Spread out over a series of islands, the task of getting around everywhere on a short visit can seem a little daunting. That is, until you realise that getting around on foot is great, taxis are expensive and rates vary, but the public transport system is fantastic. The Arlanda Express train from the airport to the centre of town takes 20 minutes. It has much in common with our London Heathrow Express - fast, efficient and expensive - but in summer they do a 2 for 1 offer to ease the pain. Tickets are available at the airport Information Desk where you can also pick up city maps . You arrive at T-Centralen station. Do not despair, the areas around railway stations are never good and it gets much better, believe me. The Swedes, I was told, are obsessed with coffee. What, more so than Londoners? After my visit to Sweden last week I can't say I saw any evidence of their capital city out-drinking London in any way, but to 'f'ika' - to spend time having coffee - is certainly an important part of their day. So, of course, once we'd checked into our hotel we went native. We had a little help. 'The White Guide Cafe' is an invaluable little book (and there's an App) rating the best of the coffee shops in Sweden. With only 48 hours in Stockholm we were never going to get around too many of them but we sniffed out the best on Södermalm. Johan & Nyström at Swedenborgsgatan 7 is a lovely place with skilled and enthusiastic staff. Yes, the Aeropress, the Chemex and the Siphon are all there, but it was simply great tasting coffee. In addition to the delicious espressos we tried what I'm calling a 'cooled brew' as I've never come across it before - coffee brewed hot then put on ice (no not an iced coffee). The result was beautifully clean-tasting, full-flavoured Kenyan coffee. Johan & Nyström also won on price, incidentally, and they had the best cinnamon and cardamom buns, which I learned they get from Dessert & Choklad). Södermalm, or Söder, by the way, is the island/area we found most interesting. It's also where you'll find the Terminal Slussen Bus and Metro Station. We found buying 24 hour SL cards invaluable for getting around by metro, bus and tram. The various ferries linking the islands are great too but the SL card isn't valid on all of them, so check. Only on our return to London did I learn that the writer Stieg Larsson took inspiration from Söder in its grittier days. It's lively with a good mix of rough and smooth, unhip and trendy with small businesses setting up on unprepossessing streets. One such is Pärlans Konfektyr at Nytorgsgatan 38. Here you'll find the most delightful toffee shop you could hope to come across. You feel just like you've walked into a 1940's film with caramel makers beavering away in the workshop to your left and the shop sales conducted by Greer Garson in Mrs Miniver's front parlour. It's a joy to find such a focused business, run by young staff, making and selling a really good product with such style. The caramels are hand-made and have just the right degree of chewyness. Sweets such as 'Salt Likrits' (salt liquorice) and Mandel & Vanilj (almond and vanilla) are subtly flavoured to perfection. They also sell jars of caramel spread and just a few other sweets. The finishing touch is the the hand-stamping and wrapping. Don't miss. Fabrique Bakery, Rosenlundsgatan 28 (bakery and coffee) and Gögatan 24 (bakery) and other branches - Londoners may have come across Fabrique Bakery in Hoxton, which I rate highly. Drop Coffee, Wollmar Yxkullsgatan 10 - rated very highly in The White Guide; we had our most expensive (3.60kr) and mostdisappointing espresso - a strange wheaty aroma and flavour, which I'm told could be down to a very light roasting of 'green' beans. Maybe just not to my taste. Urban Deli, Nytorget 4 - at this hip restaurant and deli we found the wait long, the wine thin and the food average, but nobody seemed to mind at all. Saltå Kvarn, Renstiernas gata 27 is a small grocers which started out milling organic and biodynamic flours. Unfortunately it was closed for the summer break when I visited, denying me the chance not only to see what their products were like but to ogle the rather beautiful packaging. Fotografiska, Stradsgardshmann 22 is Sweden's Museum of Photography. 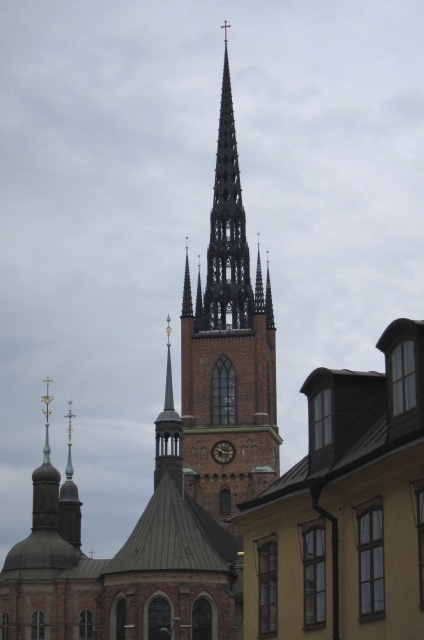 They had 3 really good exhibitions on when we visited, and the top floor houses a cafe rated for its coffee and offering a fantastic view across to the main island, Gamla Stan (the old town) and the island of Djurgården. Moving to the Östermalm district on the main island, where I would recommend to eat is P.A. & Co, Riddargatan 8 (Metro Östermalmstorez) where we ate a dish close to every Swede's heart - meatballs. Now, I've been to Berlin and utterly failed to be seduced by their obsession with Currywurst, so it was with some trepidation that I ordered 'the meatballs'. How wrong could I be, they were fantastic. Two mains, 2 large glasses of good Cotes du Rhone 560kr plus service. Östermalms Saluhall is the traditional indoor food market in Stockholm that has been serving local people since 1888. It's small and intimate with some very good food stalls - notably J. E. Olsson & Söner - and bars where I wish we'd had time to eat. Next time we surely will. Snickarbacken 7 - P.A. & Co. came recommended by Catti Åman of the retail collective Snickarbacken 7 off Birger Jarlsgatan, central Stockholm. 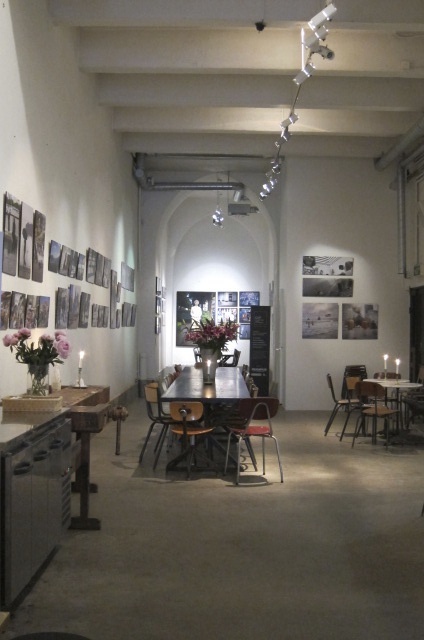 This clothes shop, coffee bar, art space, music store is a great place to 'fika' and browse. Djurgården is the greenest part of Stockholm and a great place to walk or take a tram. Rosendals Trădgård - is a biodynamic garden with an "ecological" cafe and a small deli/gift shop. I have to say I was underwhelmed by the cafe food on offer but it was after lunchtime. A plus point is you can take a tray out into the lovely gardens. They do have a wood-fired oven in the bakery producing delicious bread and they sell excellent conserves, typical of Sweden. The corner of a field planted with phacelia was a beautiful sight, and the nearby compound of wolves a surprising one. For places to stay, I'd recommend the Hotel J at Nacka Strand. It's a 20 minute ferry or 10 minute bus ride from central Stockholm. Usually, I like to be in the centre of town but this proved a good choice. Apart from the ease of public transport, it's reasonably priced, really peaceful and right by the water. There's an America's Cup theme to the hotel, the 'J' referring to the J Class yachts, and there's a New England feel to it. The rooms are good and fairly spacious with small balconies. I'd definitely recommend booking a room with a view. It serves a great breakfast in an old Villa just below the hotel and the hotel's restaurant is right at the water's edge a 3 minute stroll away. The staff were lovely, but then everyone we came across in Sweden was. On my next visit I'd like to get to restaurant Djuret, Lilla Nygatan 5 on the island of Gamla Stan. It was recommended to me by one of my favourite London chefs. Disappointingly it closes in July for summer holidays. One coffe place I would try to get to another time is Mean Coffee at Vasagatan 38, close to Terminal Centralen - mainly because it came recommended by someone from Johan & Nyström. Dining out can be expensive in Sweden, with hefty taxes on wine, but portions tend to be large so don't over-order, and do go there! I'm sure you won't be disappointed.